Innovative design ensures even water distribution with no brown spots. High impact polymer construction stands up to the elements, year after year. Built-in pressure regulator eliminates wasteful misting. A patented pressure-activated wiper seal provides optimum pop-up and pop-down reliability, while reducing water waste. Includes Seal-A-Matic(TM) which prevents puddling and run-off that can erode a landscape. With RainBird 1800 Series Pop-Ups, you no longer need to have a green thumb to have a beautiful landscape. 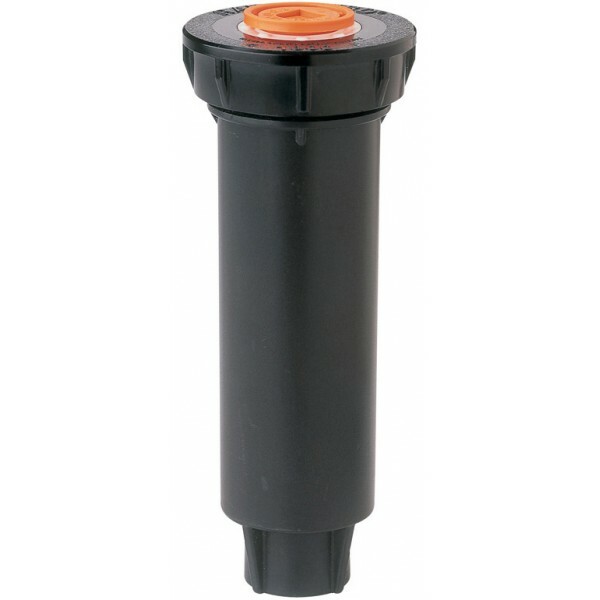 These durable, dependable spray heads work like magic to meet all your yard's watering requirements, year after year. Whether they are used in small or large grass areas or in flower beds, the 1800 Series Pop-Ups will do the job right. Note: Sprinkler sizing relates to pop-up height, not overall body size. These Variable Arc Nozzles by RainBird are the perfect option of oddly shaped garden beds. The spray arc on these nozzles is completely adjustable, they can be set at 5o or 360o.They have a handy textured collar and base to make adjusting easy and a left edge indicator so you can easily judge where the spray arc will be set. And there is al.. Rain Bird HE-VAN nozzles offer even coverage throughout the spray pattern, delivering a healthy, beautiful landscape. Gentle close-in watering eliminates dry spots around the spray head. HE-VAN nozzles also generate large wind-resistant water droplets that prevent misting and airborne evaporation so the right amount of water is delivered to the rig..